This is a free service to support ETJ members. If you are an ETJ member and have developed your own teaching materials, click here to contact Language Teaching Professionals about having your materials included on this site. David is originally from Newcastle upon Tyne, England, though he left there in 1969 to become a member of the Royal Air Force and after nine years in the services he emigrated to South Africa where he lived and worked as an aircraft technician for eight years, during which time he married his wife Yasuko and witnessed the birth of their two eldest children. Then in 1986 his family moved to Kagoshima prefecture, Japan, where he continues to live. He has been developing teaching resources and teaching at his own school (where he is assisted by his wife) since 1986. He has experienced many teaching situations from preschool through to adults, but is presently focused on material development, his university classes and his own school, West Side English School. 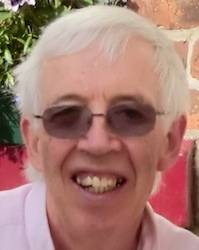 David has been involved with ETJ and Language Teaching Professionals since their inception, he is a prolific creator of teaching materials and presently has six workbooks, four digital data CDs and over 100 card games in print. Aside from creating teaching materials, David enjoys gardening and DIY. The DIY includes producing most of his teaching materials by hand.